After the dough is mixed up, you need to divide the dough into 5 pieces (the original recipe suggested 7 pieces). Put each piece in a separate bowl. Add several drops of food coloring in each bowl. Make each piece a different color. We used: pink, purple, blue, yellow, blue, and green. 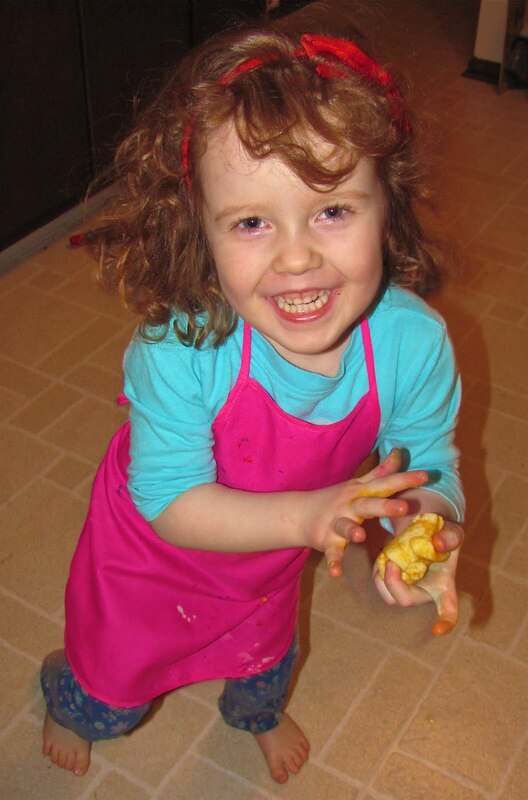 Work the color into each piece of dough with your hands. Expect that your hands will get stained from the food coloring. Roll the dough into a ball. Cassie LOVED this part!! Make sure to wash your hands between each color or the next color will get contaminated with the previous color! Beautiful colorful dough! A lot like play dough!! Press all the pieces together until you have your desired "marbled" effect. The original recipe did not marble it, so this is where we got a little more creative. The ball pictured could be marbled more. Shape the marbled ball into a cylinder shape that is about 8 inches long. Before slicing, make sure you chill the dough in the refrigerator for 15 minutes to make the dough easier to slice!! Then slice the cylinder in 1/4 inch slices. I marked the cylinder with knife marks for Cassie so that she could cut the slices herself with a butter knife. Fun! Once they were sliced I had to shape the circle shape to resemble an egg shape. A little tricky, but worth it! Place them on a cookie sheet and your ready to bake them for 10-15 minutes at 350 degrees. The recipe only makes a dozen, so you'll have to double it if you want more. Here are the finished cookies cooling. Yummy and like a butter cookie!!! 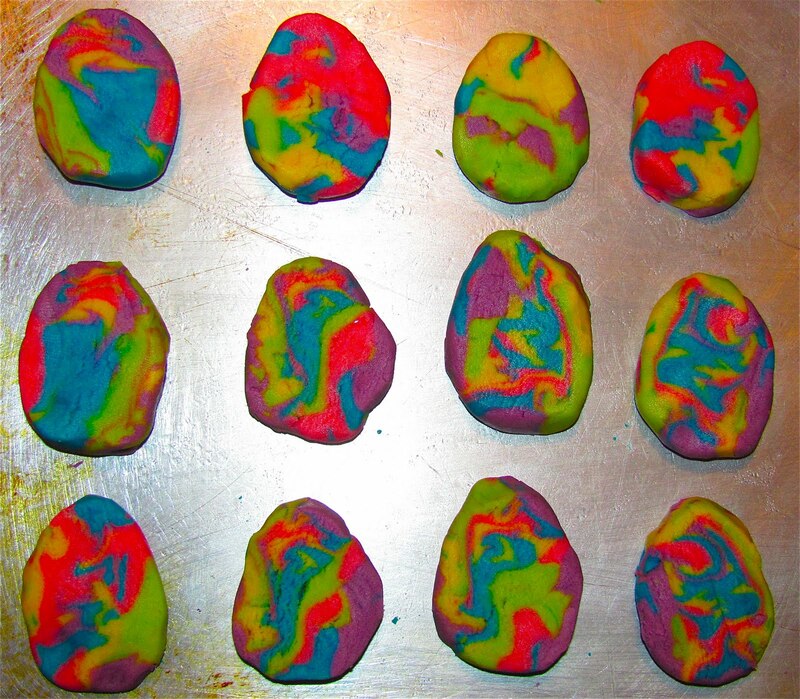 We made these Marvelous Marbled Easter Egg Cookies last year too. Maybe this will be our Easter tradition? Do you have any special Easter recipes that you make each year? Ironic that these Egg Shaped Cookies are eggless! Thanks! Wow - these cookies are marvelous. It's so great when children express their ideas so dramatically and in context! Cassie's joy in these cookies is so evident in her choiced of words, and her happy face! Thank you for this recipe, I might do this with my children, I think they'd love it too. My son and I used to enjoy "Egg in a Hole", sometimes I think called "Toad in a Hole", I just cut a circle out of a piece of bread and fried it on the griddle and dropped an egg into the hole, to cook. We used to enjoy it for breakfast, and supper. Thank you for the idea for playdough marvelous eggs as well. These colours by McCormick are great - very vivid - and these colours are springlike certainly! I usually use the usual food colouring but I think it would be worthwhile buying these colours for this project! The colors are gorgeous! We probably wouldn't eat those but I think they would make a fun decoration! 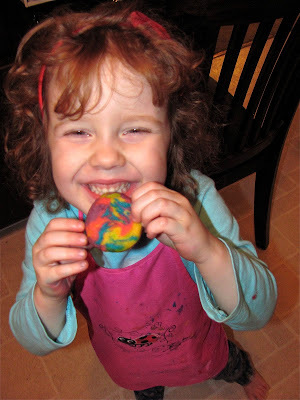 rainbow cookies -- how wonderful!! mmmmm, and these look so yummy. i love the expression on cassie's face when she's holding the ball of dough. 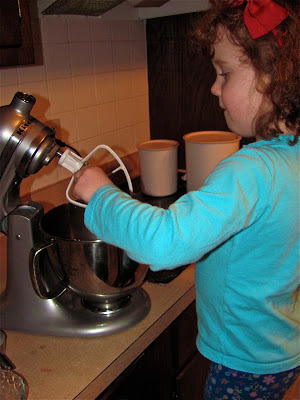 this might have to become part of our traditions too -- i know my daughter would enjoy this. Absolutely gorgeous! I can see us doing this for an activity in colors as well! Thanks! Now that is way too cute!! Love them!! Cassie is a doll! What a smile! 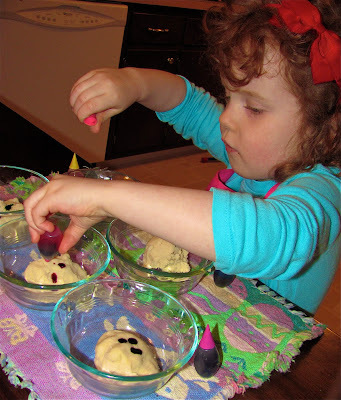 what a fun idea for cookies! they look fantastic, just like the dyed Easter eggs! I love these!! We are totally doing these next week! Thank you so much for sharing! This week we are doing some of your paper mache eggs....excited about that too! This is an absolutely ADORABLE Easter project! I'd love to feature it on http://Blog.CookiesKids.com, http://Facebook.com/CookiesKidsFans, and http://Twitter.com/CookiesKids, but I'll need your permission beforehand, of course. When I first saw the picture and title, I originally read it as "Marble-ous Easter Egg Cookies" - although I wasn't too far off. ;-) Can't wait to try these at home! They look far too pretty to eat! :-) Very cute!! Great idea! Such a fun Easter cookie! You beat me to it! 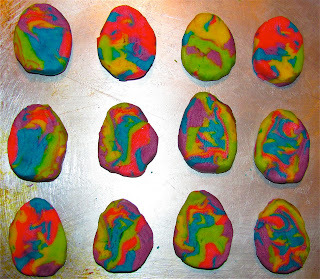 LOL I use a similar dough to make colorful cookies, but had a different egg idea in mind. If I ever get it done and posted I'll link over to yours so people can see how to marble them too. Cool! These look so yummy! Thanks for linking up to my party. Oooh how delicious! and aren't Easter Eggs just the perfect shape for all that pretty colour! Love love love! I love the marbled effect - beautiful. Lovely to see you at the Play Academy!